The Murcia airport is located 25 kilometers south of the city of Murcia, and 25 kilometers north of the city of Cartagena, and has access with both cities by the Murcia A-30 motorway in approximately 30 minutes for each of them. 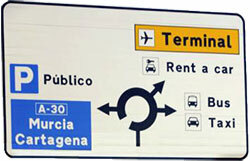 Driving on the A-30 from Murcia city, the exit towards the airport of Murcia is the nº: 161 (RM-16 or highway of the airport), and the exit driving on the A-30 from Cartagena is the nº: 164 (road RM-17 to join the RM-16). Drive to other cities around Murcia Region has relatively fast and easy access thanks to the motorway network. For example, Lorca in less than 1 hour driving, Huelva, Los Alcázares (in La Manga del Mar Menor) is 45 minutes driving, Torrevieja is 50 minutes, Mazarrón is 40 minutes, Águilas in just over an hour, or Albacete less 2 hours driving. RM-16 Salida 161: Airport highway. Access to the airport from Murcia driving on the A-30. RM-17 Salida 164:Access to the airport from Cartagena driving on the A-30. Take the A-30 in Murcia city towards Cartagena. Take RM-16 and continue to the airport. Head on the A-7 / E-15 towards Murcia. Take RM-2 towards Fuente Álamo. Keep on until A-30 and head on towards Murcia. At Exit 161 take RM-16 and continue to the airport. Take N-332 or Ap-7 (toll) towards San Javier. Keep on RM-19 until la A-30. Take A-30 towards Cartagena until Exit 161 (RM-16). At Exit 1 North, take Ap-7 / E15 towards Murcia. Continue to exit 810 to take A-30 towards Murcia. Follow the A-30 and exit at Exit 164 (RM-17) to connect next RM-16 to the Airport. Head on the AP-7 towards Cartagena. Take Exit 164 (RM-17) to connect next RM-16 to the Airport.